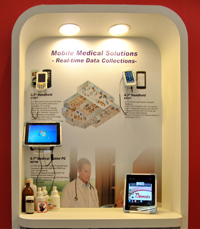 Winmate Communication INC., the leading IPC and Rugged Tablet company, is introducing its latest Rugged Tablet and Handheld and their solutions in IoT (the Internet of Things) in Computex 2012, Taipei. This year Winmate’s booth locates on Internet of Things Area in Hall 1, TWTC. It shows how Winmate focuses on integration between its products and IoT applications. There are several topics in the booth. The first one is agriculture application. Winmate’s S370T-RF, built-in RFID reader, can record livestock growth, and transmit data back to server via 3G. Another specific show area is car manufacturing application. 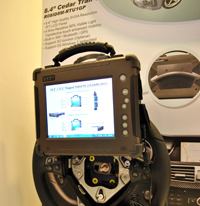 Winmate’s latest Cedar Trail Rugged Tablet PC can connect vehicle internal system via CANBUS to do further inspection during production process. In addition, the Rugged Tablet PC can communicate with E430T-BR, a light industrial PDA, which can be handheld by operators to scan other vehicle devices via barcode reader. Medical solution is an important field Winmate concentrates on this year. Winmate presents M970D, which is Cedar Trail mobile tablet to show patients’ record conveniently, and C350T-BR, which can be used to scan medical information. There are more new Rugged Handheld and PPC products in Winmate booth. Please visit Winmate at Booth A0438 on 5~9 June.